Data collected by the BPR&D for the year 2013 shows that almost 80 per cent of SPs in districts across the country got transferred within two years of their tenure in a district. 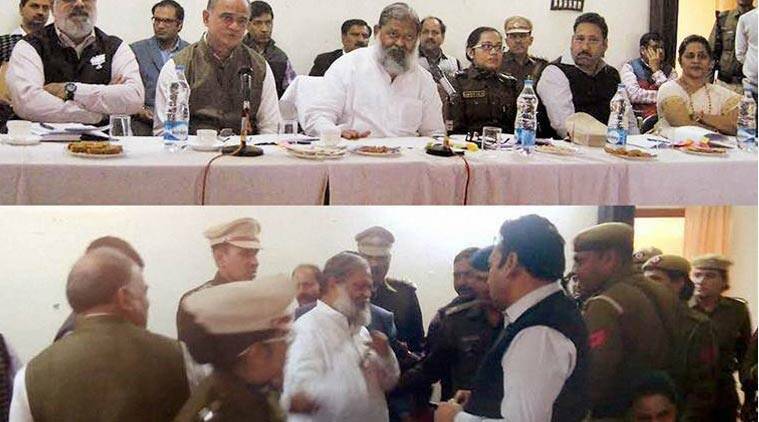 A verbal spat between Haryana Health Minister Anil Vij and Fatehabad SP Sangeeta Kalia, which seemingly led to the latter’s transfer Saturday, has brought into focus the arbitrariness exercised by state governments in transferring police officers, in contravention of Supreme Court directives. Data collected by the Bureau of Police Research and Development (BPR&D) for the year 2013 shows that almost 80 per cent of SPs in districts across the country got transferred within two years of their tenure in a district. More than 50 per cent got transferred in less than a year. A 2006 SC directive in a case on police reforms had stated that state governments must fix a two-year tenure for field officers (station house officer and above). According to data collated by BPR&D for 2013, a total of 349 SPs across the country were transferred within one year, while 163 had to demit office in less than two years. There are 651 districts across 29 states and six union territories in the country. Each district is headed by a superintendent of police (SP) for maintenance of law and order. In 2012, 221 SPs were transferred within the first year of tenure, while 173 SPs had to take up a new assignment in less than two years. The objective of the SC directive was to loosen the stranglehold of the political class on police machinery so that officers can enforce the rule of law without fear or favour. 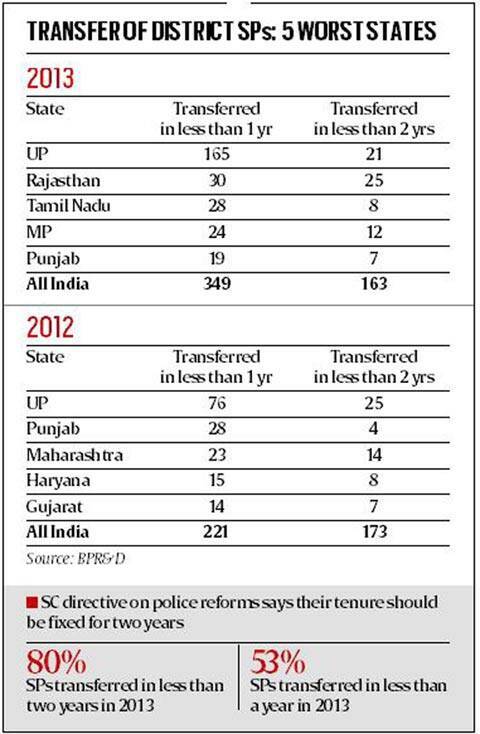 However, just as the ultimate goal of the SC judgment (implementation of police reforms) has been scuttled by various states, the BPR&D data shows that state governments continue to use arbitrary transfers as a tool to keep the police under political control. According to the data, Uttar Pradesh has been the worst offender in terms of transferring officers before their two-year tenure is complete. In 2012, the state with 72 districts, transferred 76 SPs in less than one year of their tenure and 25 in less than two years. In 2013, it transferred 165 SPs in less than one year and 21 in less than two years. The number of transfers is greater than the number of districts as many officers have faced several transfers in a year or two. Even officers senior to SPs have not been spared. As per the data, in 2013, 114 range DIGs faced transfer within a year of their tenure. As many as 48 were transferred within two years. Haryana, where SP Sangeeta Kalia was transferred, saw 11 SPs transferred in less than one year of their tenure in 2013. In 2012, the state with 21 districts transferred 15 SPs in less than one year. Other states which have recorded high number of such transfers include Punjab, Madhya Pradesh, Rajasthan, Gujarat, Maharashtra and Tamil Nadu.